While visiting Vermont, less than a year after the devastation of the tropical storm Irene, I witnessed the aftermath of that devastating storm which literally wiped out the town of Waterbury, VT. In speaking to a local real estate agent who lost her home, that had been in her family for over 100 years; sat next to a tiny little stream that ran along the roadway just outside her front door; which typically dried up after the spring snow melt; turned into a raging 100 foot wide river that swept away her house. Where once was her living room, now sat a bolder the size of a compact car. Pointing to the opposite bank of the now placid stream, she said, that was all trees up there on the hill side that got washed away. Where she was pointing looked to be some 25 to 30 feet in height. At a detour in the road she remarked that this closed section of the road, which once connected all the communities, still required air lifts of food and water to the stranded families. Listening to the weather channel while trying to decide what days were best this week to paddle, they showed a clip of Vice President Joe Biden in Colorado evaluating their recent flood damage. Aside from the 30 plus who lost their lives, Biden was shocked by the power of the water to change the shape of the land so much so that communities were now isolated and could only be reached by helicopter. This story was followed by interviews of people who for 30 years lived next to a quite little stream that turned into a raging monster that wiped out their home and their town. In college I took a series of geology courses, the most interesting of which was titled the Geology of our National Parks. 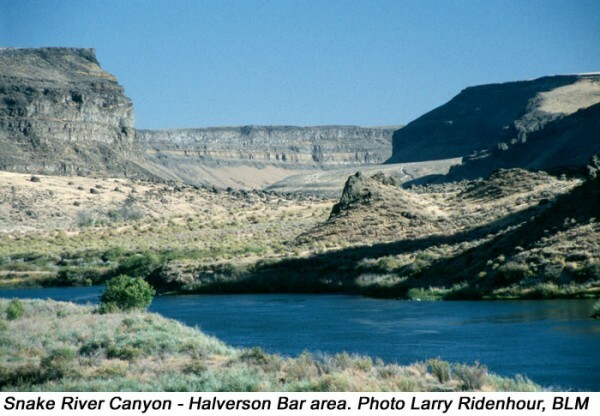 A lecture on how the Snake River Canyon in Idaho (photo below) was formed some 14,000 years ago, in less than a week, was a true awakening for me as to the power of water. Normally, it takes millions of years for a river to cut through the bedrock in order to form the high, sheer cliffs of a river canyon; the Colorado River is a prime example of that slow, erosion process. Lake Bonneville once covered the entire state of Utah and part of Idaho that was 1,000 feet deep and some 20,000 square miles wide! There was a natural dam across Red Rock Pass, Idaho that suddenly collapsed and lowered the lake by some 300 plus feet of water. Over 1,000 cubic miles of water was released over several days to form the Snake River Canyon as we know it today. The destructive power of water is due to its weight; just over 64 lbs per cubic foot. But weight alone is only half the story. Put that weight into motion and you have a destructive force second to none. Tidal waves have been recorded at over 300 miles per hour, although the maximum theoretical speed of a tidal wave is 600 miles per hour. Two thirds of the planet is covered by water. Plants and animals, our selves included, are made up of 98% water. Water claims more lives than any other natural disaster. Water at high pressure is used industrially to cut through steel. One would need a super computer to calculate the force needed to move a bolder or pick up a car or to knock a house off its foundation. But, you don’t need a computer to see the destructive power of water after a storm. As kayakers we view the water as something to play in and on, but we need to be mindful of just how powerful and dangerous a force it can be.